From all the digital snow flying around, it’s clear the holiday season has definitely arrived, and of course, if you’re thinking about the holidays, you’re thinking about…time management games? In any case, My Little Restaurant has released their holiday-themed edition just in time to ride in on Santa and Rudolph’s coattails. A time management game in a similar style to the Diner Dash and Sally’s Spa empires, My Little Restaurant is a lightweight, but familiar game offering. You are responsible for running the front end of a restaurant, which includes seating patrons, waiting tables, clearing dishes, and keeping everybody happy. There’s definitely a lot of fast-paced clicking involved, and a clear head for keeping track of multiple tasks at once is vital for keeping your bouncing bistro afloat. The Christmas edition works in a whole lot of holiday at more than just a cosmetic level. In addition to all the holiday decorations and Christmas-tree menu, Santa has been brought in as the tutorial guide, leaving little presents on occasion to help you through the difficult levels. There are also little touches in the levels, like holiday performers you can activate to keep guests happy and occasional presents to collect from satisfied customers. You have to be quick collecting the presents though, otherwise they’ll be snatched away by a mischievous elf, but collecting presents throughout the levels lets you unlock special holiday cards and extras. 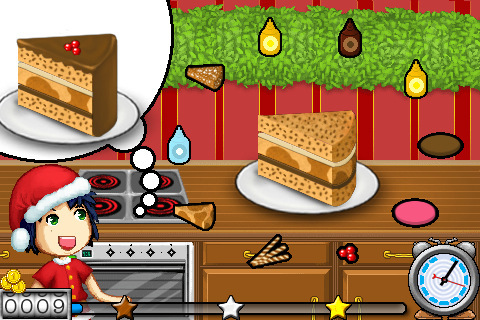 There are also additional mini-games to help break up the day to day restaurant grind, like assembling elaborate cakes. These mini-games are slightly less frantic than the normal levels, but still a fast-paced challenge. Basically, if you’ve played a time management game before, this is going to look familiar, but festive. It doesn’t really bring much by way of innovation, and the fuzzy and generic graphics are nothing to write home about, but the overall presentation is pleasant. The one thing the game really lacks is customization. You do get upgrades as you work through the game, but they’re automatic, and you never really get a chance to feel like you’re the one calling the shots. You just accept Santa’s gifts when he brings them by, and you get back to work, which takes a little of the fun out of it. There’s also no real story to make you feel invested in the action. I’m not expecting Shakespeare, but it feels like there should be some reason for slaving away in the restaurant other than Christmas spirits. All in all, My Little Restaurant: Christmas Edition is about what you’d expect from a time management game. It’s nothing new and doesn’t really measure up to Diner Dash, but it’s cute and pleasantly predictable, all wrapped up in a pretty holiday bow. AppSafari review of My Little Restaurant: Christmas Edition was written by Tracy Yonemoto on December 12th, 2010 and categorized under App Store, Games, Mini Games, Time Management. Page viewed 4770 times, 2 so far today. Need help on using these apps? Please read the Help Page.